Has there ever been a game less in need of a reboot than Doom? Id Software birthed the first-person shooter with Wolfenstein 3D, but with 1993’s original Doom they gave the genre a baptism of blood. That game is as gripping today as it was 23 years ago. First-person shooters (once called “Doom clones”) have evolved a lot since the early ’90s to accommodate richer stories, more robust multiplayer, and less punishing difficulties, but comparing modern shooters directly to Doom still inspires the feeling that, for all these steps forward, something has been lost. Even after all these years, Doom’s mile-a-minute symphony of carnage has never been topped. 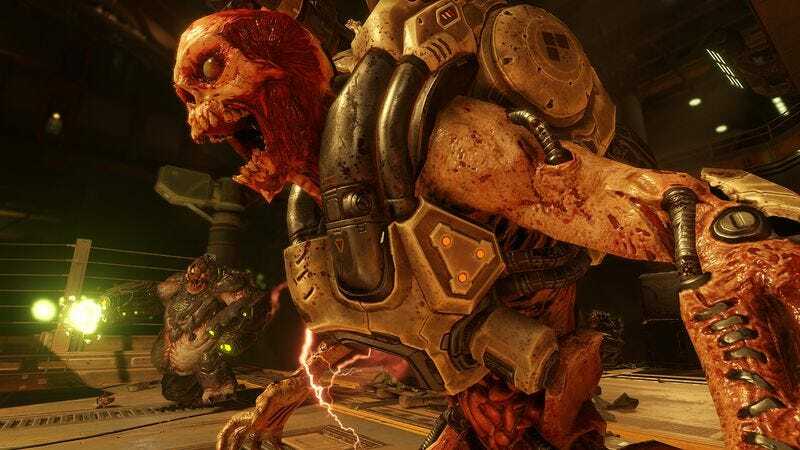 It’s not much of a surprise that Bethesda and Id Software’s latest Doom takes an “if it ain’t broke, don’t fix it” approach to rebooting the series. What is surprising is the number of things the developers considered broken and how stellar a job they’ve done fixing them. Everything about the new Doom, right down to its name, is crying out to be measured against the original. Few games would survive such direct comparison to the grandaddy of first-person shooters, but 2016’s Doom doesn’t just survive; it flourishes. It took 23 years, but Id Software has finally done what nobody else has managed in that time: They’ve improved on Doom. New Doom instantly makes its priorities clear. The time between selecting “new game” and emptying a clip into a shambling demon is measured in seconds. The first thing you’ll notice about the still-nameless Doom guy is how quickly he moves. He slides around the game’s Martian arenas as if he were in socks and the whole planet is one big kitchen floor. He’s also become more acrobatic, so jumping and climbing around arenas is a must. It’s exhilarating, but to whom much is given, much is expected. Speed is the first of many tools Doom expects you to learn to use properly. Even common enemies can keep pace with you in battle, and the price for slowing down—or, heaven forbid, standing still—is often almost instant death. Moving fast is just half the battle. You also have to hit hard. To call Doom brutal would be underselling it, but unlike the 1993 game, the carnage of 2016’s Doom is not its own reward. Executing savage “glory kills” against staggered enemies rewards you with extra health, and using the series’ iconic chainsaw yields bonus ammo. Because you take damage quickly and need to spend ammunition liberally to keep your head above water, these two systems are crucial to survival. The more danger you’re in, the more aggressively you have to fight, and the greater your incentive to get up-close-and-personal instead of retreating. Running away to regroup or collect health drops, like you could in the original, is a temporary solution at best, and a death sentence at worst. Because you can use combat encounters to earn health and ammo, not just lose them, the new Doom has had to re-think how it incorporates exploration into its levels. Opening hidden doors and navigating into out-of-the-way spaces to reap their secret bounties was a huge part of the original, but that game could only reward your efforts with fleeting resources, like health, power-ups, or ammo. To make exploration more essential to new Doom’s rhythm, the prizes are now permanent character upgrades. The Doom guy himself, his armor, and his every weapon can now be outfitted with unlockable modifications, and the combat is so punishing that you’ll need every scrap of help you can get. It turns discovering a hidden area from a neat distraction into a miniature victory that opens up new strategic opportunities for the rest of the game. So if the new Doom improves on the original’s movement, combat, and exploration, is it the superior game? Not quite, although it’s a close race. The new Doom’s biggest stumbling block is its increased attempts at storytelling. Its story is nonintrusive, but it’s a distraction and a step down from the all-atmosphere-no-plot approach of the original. It’s also oddly weak in some of its visual and sound design. Weapons are mostly returning favorites like the BFG-9000, but with generic sci-fi redesigns that make it hard to tell exactly what you have equipped at a glance. The Plasma Rifle is especially underserved, its new pew-pew-pew sound effect withering in comparison to the original model’s eardrum-lacerating VWARP-VWARP-VWARP. It’s an odd blind spot for the game, especially considering the tremendous strength of its environment and monster design. Perhaps “if it ain’t broke, don’t fix it” wasn’t the design ethos of the new Doom. A more accurate description would probably be “the same, but more.” Faster and with more movement options. More enemy types that appear in greater numbers and hit harder. More weapons with more uses. But also more exposition, more characters, more needless world building. More muscle, but more fat to go along with it. Still, any game that demands to be measured against one of the medium’s towering accomplishments and comes out ahead in many aspects has to be admired for its huge guts. The fact that this game also has the honor of doing the Doom name proud is just the gory icing on this exquisitely violent cake.